October is the time of year when thoughts, conversations, theater, TV movies and even commercials revolve around the macabre. Lately, I’ve actually turned my television off because the commercials are so disturbing. Occult themes seem to be increasing in popularity, spilling over into other months and sadly even dominating television networks geared to the Tween and Teen genre. Where and when did all this originate and why oh why is it so enticing? 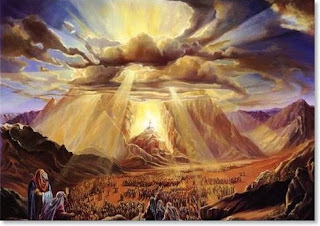 “Then it came to pass on the third day, in the morning, that there were thunderings and lightnings, and a thick cloud on the mountain; and the sound of the trumpet was very loud, so that all the people who were in the camp trembled.” (Exodus 19:16) Moses constructed boundaries, consecrated Mount Sinai, and sanctified the people, meaning he called for repentance of sin and humility of heart. Their inner man needed to be as clean as their outer. He instructed them to bathe, don clean apparel, and abstain from intimate relations with their spouse, all in preparation for this third day. Soon Israel would hear the voice of God. As Moses descended Mt. Sinai with the message from the Lord, below the sea of Israelite tents grew larger with each step. The Creator of the Universe had chosen this place and Israel from among all the people of the earth. Will Israel ever comprehend the magnitude of this moment? If he reminds them of how the Lord God Almighty sustained them in the wilderness, almost as if He bore them here to Himself on eagles’ wings, then will they understand? Surely, by now all Israel recognizes His hand. But, will they accept God’s terms? Will they humble themselves and truly become His special people, a kingdom of priests, and a holy nation? It was the third month since Israel had left Egypt. At the foot of Mount Sinai, six hundred thousand plus Israelites set up camp according to tribes and families. They had heard about this mountain since Moses returned to Egypt and now they see it with their own eyes. The topic on everyone's lips must have been Almighty God appearing to Moses in a burning bush on this mountain. Did God live here? What does He look like? Would they see God and hear Him speak? Would this be their permanent home? In the days to follow, all Israel would have their answers. With Amalek defeated, Israel gladly left Rephidim and the bloody memories of battle. 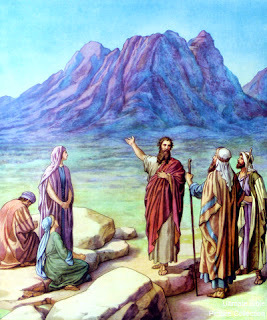 Almighty God, in the Pillar of Cloud led them to the Wilderness of Sinai and the mountain where He first appeared to Moses. This was familiar land and a place of safety, because Sinai was nearby the country Moses called home after he fled Egypt forty years earlier. Israel arrived here three months to the very day, since they had escaped. In the shadow of this great mountain, God gave them rest and peace.